We offer the quality engineered spun bond Pleated Filter Bags that utilize the latest technology to enhance dust removal in demanding or high performance applications. 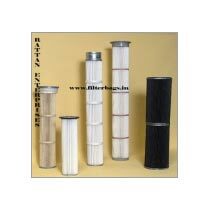 We fabricate high quality Pleated Filter Bags that replace fabric bag filters and cages, used in many dust collectors. Pleated Filter Bags are engineered to fit dust collectors of various sizes and are fabricated to ensure ease of installation and change out. Pleated Filter Bags are easily mounted into various size cell plates for both top and bottom load dust collectors. They are extensively used in various Pharmaceutical, Blasting & Grinding, Fume Plants, Pneumatic Conveying Industries, etc.